The people over at Modern Life came up with this great idea to try out some WordPress tactics. What they ended up with was a fun, whimsical theme that is stylishly retro and nostalgic. Retro MacOS free WordPress theme evokes the look and feel of days gone by. I can almost hear the whirring of the tower fan and the dial tone of my 56K modem connecting me to the world wide web via one of AOL’s millions of free trial floppies sent out back in the day. Retro MacOS free theme is perfect for those who enjoy something a little quirky and is perfect for the tech nerd in all of us. Give Retro MacOS a spin at the end of the post! 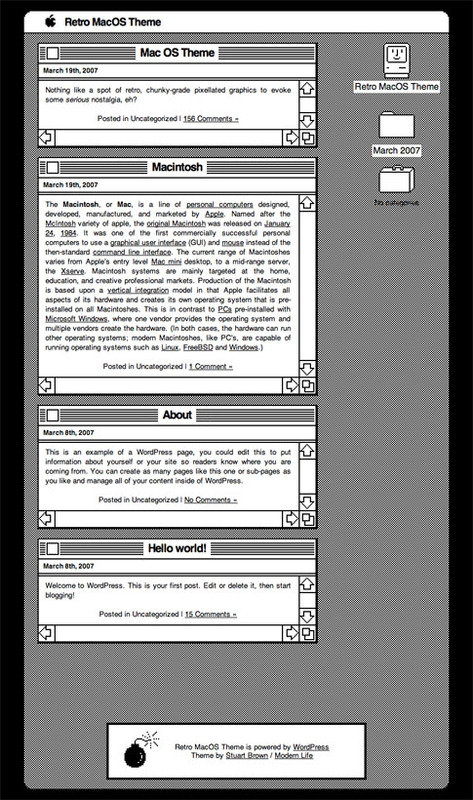 Come back and check out the showcase as we find more sites from around the web using Retro MacOS.